Litterateur, publicist, and viticulturalist; born in Prague, Bohemia, Jan. 15, 1822; died in St. Louis, Mo., Aug. 5, 1898. His maternal great-grandfather was Israel Hönig, Edler von Hönigsberg, the first Jew raised to nobility in Austria (see Kompert, "Oesterreichische Adelshalle für Israeliten"). When seven years old Bush was seriously burned at a conflagration, suffering all his life from the effects, but rising superior to the consequent physical infirmities through an iron will and a naturally strong constitution. Bush received his education from private teachers, and owed his literary bent to the cultured circles and rare minds (such as Leopold Zunz and Michael Sachs) with which he came in contact from boyhood. When fifteen years of age, he entered Schmid's Oriental printing establishment in Vienna, which his father had acquired. The Talmud published with the imprint of Von Schmid and Bush is still prized for its exactness. For six years (1842-47) Bush edited and published the "Kalender und Jahrbuch für Israeliten" (Vienna). Its plan was the presentation in the same book of the productions of leading Jewish scholars of divergent views. Among these were Leopold Zunz, S. L. Rapoport, S. D. Luzzatto, Gotthold Salomon, Ludwig Philippson, Michael Sachs, Noah Mannheimer, Joseph Wertheimer, Leopold Stern, Theodor Creizenach, Ludwig August Frankl, Leopold Kompert, Leopold Löw, and Simon Szanto. Some of these made their first appearance as writers in the pages of the "Jahrbücher." 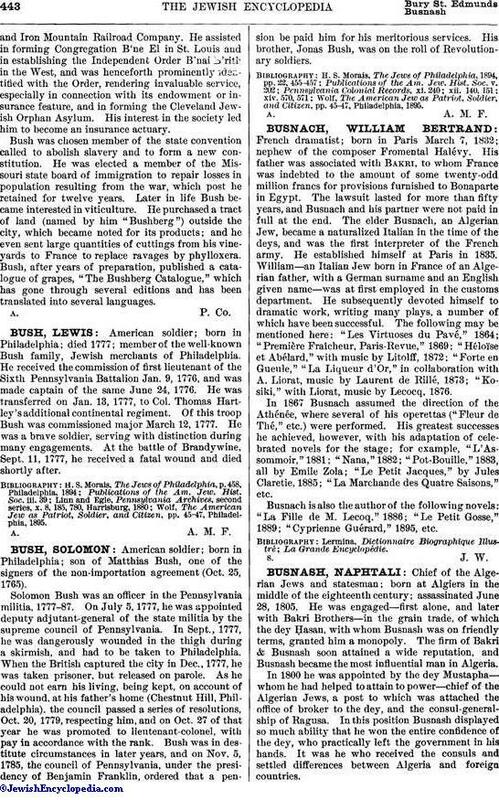 In 1844 he edited "Mesillat ha-Limmud" (Way of Instruction), which was published by his father after Bush had left for America. Liberal in politics, he edited the "Organ für Glaubensfreiheit," and other revolutionary papers issued from his press. When the Revolution of 1848 failed he had to flee to New York, where he arrived Jan. 8, 1849. 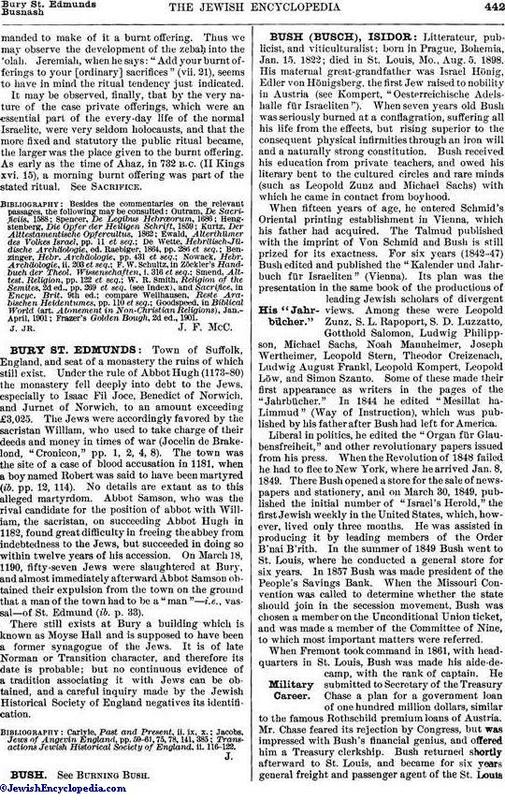 There Bush opened a store for the sale of newspapers and stationery, and on March 30, 1849, published the initial number of "Israel's Herold," the first Jewish weekly in the United States, which, however, lived only three months. He was assisted in producing it by leading members of the Order B'nai B'rith. In the summer of 1849 Bush went to St. Louis, where he conducted a general store for six years. In 1857 Bush was made president of the People's Savings Bank. When the Missouri Convention was called to determine whether the state should join in the secession movement, Bush was chosen a member on the Unconditional Union ticket, and was made a member of the Committee of Nine, to which most important matters were referred. When Fremont took command in 1861, with headquarters in St. Louis, Bush was made his aide-de-camp, with the rank of captain. He submitted to Secretary of the Treasury Chase a plan for a government loan of one hundred million dollars, similar to the famous Rothschild premium loans of Austria. Mr. Chase feared its rejection by Congress, but was impressed with Bush's financial genius, and offered him a Treasury clerkship. Bush returned shortly afterward to St. Louis, and became for six years general freight and passenger agent of the St. Louisand Iron Mountain Railroad Company. He assisted in forming Congregation B'ne El in St. Louis and in establishing the Independent Order B'nai B'rith in the West, and was henceforth prominently identified with the Order, rendering invaluable service, especially in connection with its endowment or insurance feature, and in forming the Cleveland Jewish Orphan Asylum. His interest in the society led him to become an insurance actuary. Bush was chosen member of the state convention called to abolish slavery and to form a new constitution. He was elected a member of the Missouri state board of immigration to repair losses in population resulting from the war, which post he retained for twelve years. Later in life Bush became interested in viticulture. He purchased a tract of land (named by him "Bushberg") outside the city, which became noted for its products; and he even sent large quantities of cuttings from his vineyards to France to replace ravages by phylloxera. Bush, after years of preparation, published a catalogue of grapes, "The Bushberg Catalogue," which has gone through several editions and has been translated into several languages.